Many moviegoers in the western world have learned the name of Hayao Miyazaki, the revered animator often referred to as “the Walt Disney of Japan” and head of the Studio Ghibli animation house. It might come as a surprise, however, for viewers to discover that not every Studio Ghibli production is actually directed by Miyazaki, himself. The popular Pom Poko is one such Miyazaki-less film, as is their version of Tales From Earthsea (directed by Miyazaki’s son, Goro). 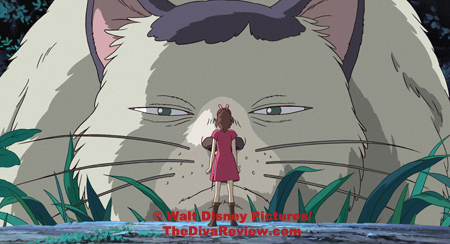 One of my personal Ghibli favourites, The Cat Returns, is a fine example of great work that didn’t necessarily require the master at the helm. 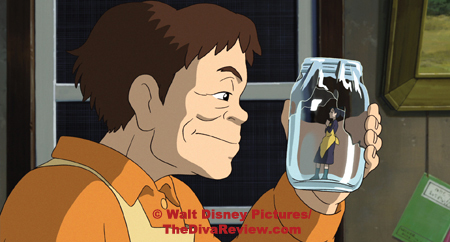 Based on the classic children’s novel, The Borrowers by Mary Norton, moviegoers can add The Secret World of Arrietty, directed by Hiromasa Yonebayashi to the list of wonderful non-Miyazaki Studio Ghibli fare. Riding out of the city, young Shawn will be spending some time at his aunt’s country house. His mother sends the boy, who suffers from a debilitating heart condition, to recuperate at her childhood home. The house is ensconced deep in the woods and everything is green grass and blue skies. The prospect of the boy spending his summer with his older aunt and her elderly, dotty housekeeper becomes much more interesting when he spies something moving in the garden. The family cat is attacking an unseen assailant; unseen because the victim is so tiny as to use a leaf as camouflage. Escaping the feline’s clutches, the wee figure grabs up a few bits of foliage and makes for the crevices under the house, where her equally-teensy family live. It’s lucky she hadn’t been made into cat food, because it’s a big day for young Arrietty; tonight she will accompany her father on her first “borrowing”; a rite of passage where the small folk abscond with “borrowed” items around the house, like food and other necessities that enable the family to survive. The danger of this operation is great and over time, the numbers of Borrowers has dwindled. 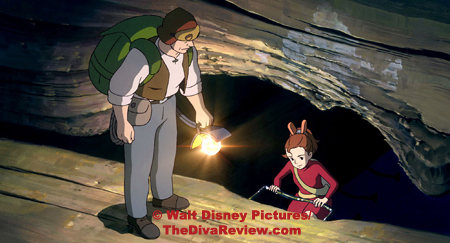 Arrietty’s family is the last of their kind out of many that used to live under the floorboards. Of the interference by rats, cats and other disasters, the one Borrowers fear most is discovery by humans. If one person spots a Borrower, it inevitably leads to more people trying to find them and that curiosity ends up destroying the Borrowers’ entire lives. 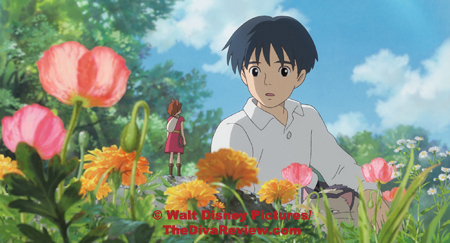 When Arrietty’s first “borrowing” goes wrong and she’s seen by Shawn, it’s enough to start her parents’ preparations to find other accommodation with the help of another Borrower found foraging in the woods. Arrietty isn’t convinced that the sickly lad means any harm. Her curiosity and Shawn’s kindness brings them closer. 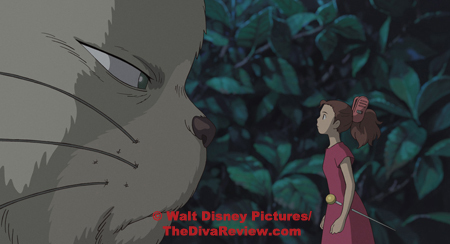 Unfortunately, Shawn’s attempts to care for Arrietty while hiding her existence runs afoul of nosy housekeeper, Haru, who traces Shawn’s steps, unearths Arrietty’s home and captures her mother. 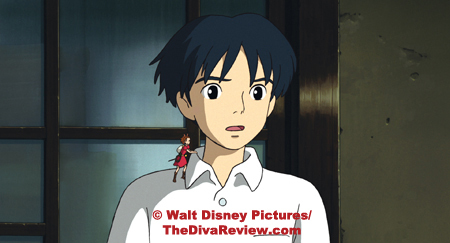 Arrietty and her new oversized friend must rescue her mother and come to terms with the possibility that Haru’s awareness of the legendary Borrowers may mean that the tiny family’s relocation is inevitable. 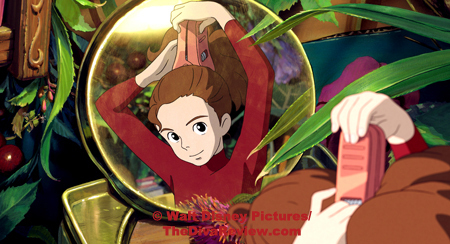 Vibrant, beautiful and bursting with light and colour, The Secret World of Arrietty is a gorgeous thing to see; like the pages of a children’s storybook come to life. The sunlight pouring through the trees onto the green hillsides where every blade of grass seems to move independently is lush and breathtakingly rendered. Still, everyone knows Studio Ghibli rocks the pretty like no other animation house. It takes a well-told tale to make a good film and luckily, that’s what we have here with the adventures of the tiny girl facing the perils of the human-sized world that seem completely innocuous to bigger folks. The inventiveness by which the Borrowers achieve their living is fun to watch; like their careful negotiation of nails and beams inside the walls of the house where one slip could mean catastrophe and Arrietty’s dad’s clever application of double-sided tape that enables him to scale the kitchen furniture and swipe some vittles. There is always the imminent danger of discovery by the humans or the family cat, or a plunge below to where the vicious-looking, glowing-eyed rats dwell. The grasshoppers in the garden are a benign annoyance, while the crows are murder. Arrietty herself is a wonderful character; resourceful, brave and curious about the larger world outside, but is still a devoted daughter to her worried parents. Her friendship with Shawn is sweet and genuinely touching because it’s so meaningful for each of these isolated, lonely spirits. Conversely, while she’s carefully posed not to be a villain, per se, it’s hard not to loathe the character of Haru after she captures Arrietty’s mother and tries to hunt the hundreds more Borrowers she’s sure are living beneath the floorboards. Haru’s intrusion brings the full weight of inevitability to the story, even though Shawn’s aunt is enchanted by the small people and wishes for them to stay. Haru fills the slot of the Studio Ghibli “weird,” ambiguously menacing character, like Yubaba in Spirited Away, or the Witch of the Waste in Howl’s Moving Castle, with her squat posture and grotesque, warped expressions even though she’s simply meant to be a nosy old lady. Poised to be the film’s comic relief and slapstick character, Haru is written so broadly and her physical design is so off-putting that she’s just kind of disturbing and creepy. In the movie’s English dubbed version, Haru calls for exterminators to come for the Borrowers, but specifically says she doesn’t want the little people killed, just captured; yet when they arrive, the bug hunters are carrying a gas can with them. I wondered if there was an alteration to the original script. I also never got the idea that Haru saw the wee folk as anything but a nuisance; she accused them of stealing things for years, so the provision to let them live seemed to come out of nowhere. She does have a bit of a point; they are called “Borrowers,” but when one borrows something, they’re supposed to return it, and the small people never give anything back at all. From semantics to phonetics: I’m usually in favour of Disney’s dubs of the Studio Ghibli films as they’ve handled them very carefully and hired top talent to voice the characters in the past. 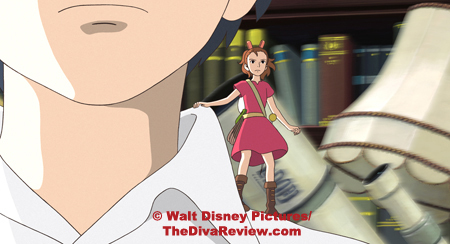 The Secret World of Arrietty, however, suffers the most careless ADR I’ve yet seen from a Disney release. 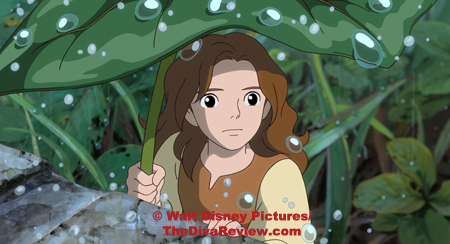 It seems like any character who must pronounce Arrietty’s name does so with extreme difficulty, including Arrietty’s parents. Haru’s dubbing is very awkward with the excellent Carol Burnett having to strain and yowl to fit the character’s mouth movements. Though these gaffes can be distracting, which no dub should ever be, and surprising when Disney usually takes such care with their projects, I’m sure no one under age twelve will notice. I just hope it’s not the start of a downward trend. 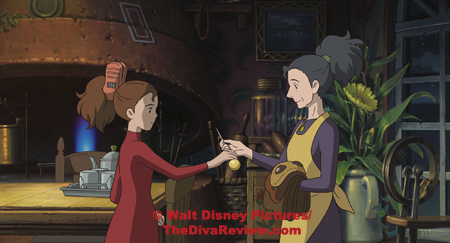 Small missteps aside, The Secret World of Arrietty is a terribly enjoyable film that will entertain the whole family, which is another reason why it works so well. This engaging and warm story of a lovely friendship has enough action and humour to satisfy all ages, and boy, it’s awfully pretty. It’s also nice to see a Studio Ghibli film hit so many high marks and do so well even without the firm hand of its master, Miyazaki, leading it.